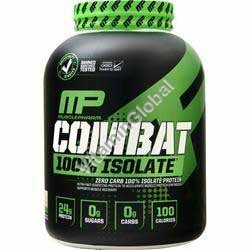 MusclePharm's Combat 100% Isolate is scientifically-engineered to deliver a whopping 24 grams of 100% whey isolate protein per 27 gram serving - high quality protein with no added fillers. After an intense workout session, your muscles are starved for nutrients and need true results fast. Isolates are of the most refined protein sources, scientifically filtered to remove fats, sugars, and carbohydrates making them a fast-digesting source of protein and an ideal solution to help deliver superior results. Suggested Use: Mix 1 scoop of COMBAT 100% ISOLATE with 6-8 fl. oz. of cold water, milk, juice or any beverage of your choice.